Today’s post is inspired by a dress that my 21 month old daughter was wearing last week. It’s the cutest little dress, with a little ruffle on the bottom and the colors look so gorgeous with her fair skin and light brown hair and pretty blue eyes. Of course, I’m slightly biased, but I think she’s the most adorable girl ever.) The colors and florals really inspired me, and I realized that I hadn’t used my new Vintage Linens set from PTI. I pulled out some Zig Clean Color markers, my archival ink, and my Misti, and got to work. I wanted to create a wreath of sorts, so I stamped one of each size of outlined flower on Post It paper to create some masks. (I bought it ages ago to use with my Cricut, but it didn’t cut worth a darn, so I am glad that I finally found a good use for it!) I stamped and masked flowers on my Strathmore watercolor paper, then used my markers to color them. (Isn’t that peachy pink just the most beautiful color??) I decided to turn it into a shaker card, so I die cut a circle out of the center. Then, I die cut a few of the larger flowers, colored them the same fuschia color, and placed them on the wreath so they overlapped with the shaker portion. I used my Fuse tool to create a shaker pocket, using seed beads and sequins from Hobby Lobby, Pretty Pink Posh, and The Ton. 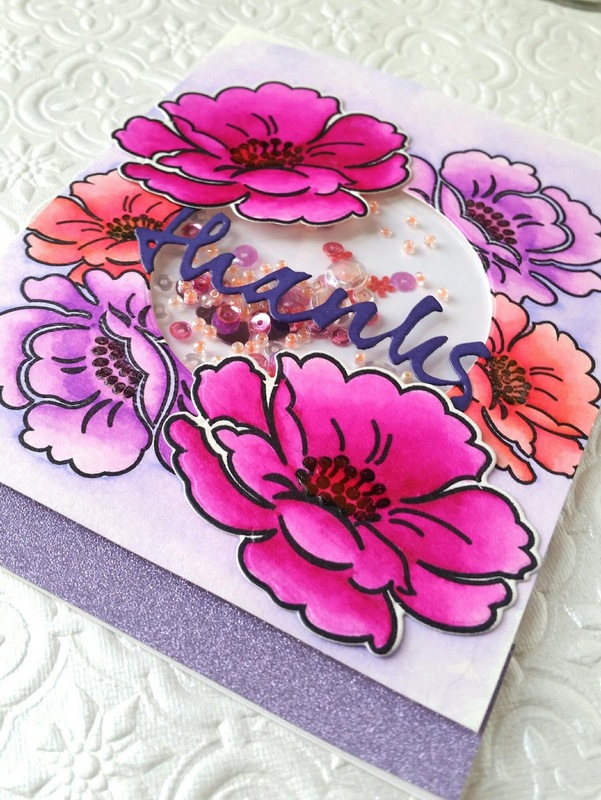 A die cut “thanks” from PTI’s Wet Paint series cut in Royal Velvet over the top of the shaker and a lilac glitter strip at the bottom of the card finished it off. Hope you all enjoyed! I’ve been working on some baby shower decor this week for my little nephew, so my card desk has been feeling sorely neglected. Hopefully I can get the bulk of the shower prep done this weekend so I can get back to my cards! Have a great weekend, friends!